Bouquet Floral Organic Micellar Water is fragrance-free and a wonderful way to freshen up. Removing make-up is quick and easy with this water: products melt off the face and the skin is left cleansed and toned. The wonderfully gentle formula is ideal for the most sensitive skins and it is very well tolerated by eyes, making it a real favourite. This micellar water combines the softening properties of rose and orange blossom floral waters with clarifying narcissus. The skin retains its natural balance and is left soft and supple on each use. 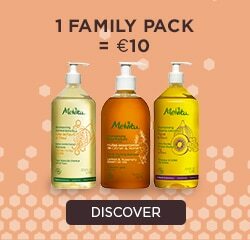 To stop the make-up removing process irritating the skin, Melvita has created a "bouquet" of its best floral waters which gently cleans skin, maintains its fragile equilibrium and prepares it for subsequent products. The cleansers and make-up removers in the Bouquet Floral range are enriched with prebiotics to look after the fragile equilibrium of skin constantly exposed to aggressors like pollution and make-up. Apply Organic Micellar Water to the face and neck in the morning and evening using a cotton pad. A floral water should always be used after a cleanser like a micellar water to remove any traces from the skin.